Airtel announced new internet offers to customers. 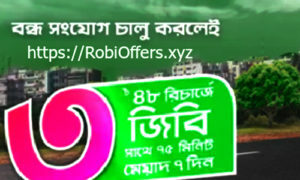 Under this offer, the subscribers will get 30 GB internet only at Tk 297. These data will be valid for 30 days. Let’s find out more about the offer. Customers will get 30 GB internet at only 297 taka. The validity of the data will be 30 days. Dial *123*297# to avail the offer. Terms & ConditionsAll prepaid subscribers of Airtel will be able to avail this offer. This offer can be purchased through recharge or code dial. This pack will auto renew when expired. The data available on this offer can be used on any network. Maximum 1GB internet can be used per day. The offer will continue till further notice, and customers can avail this offer as often as they wish.